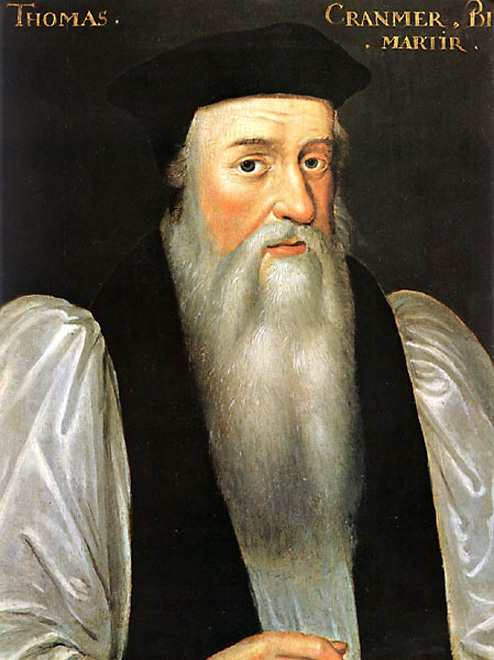 Thomas Cranmer was the principal figure in the Reformation of the English Church and was primarily responsible both for the first Book of Common Prayer of 1549 and for its first revision in 1552, as well as for the first version of the Articles of Religion. Cranmer was born at Aslockton, Nottinghamshire on July 2, 1489. At fourteen he entered Jesus College, Cambridge where by 1514 he had obtained his Bachelor of Arts and Master of Arts degrees and a Fellowship. In 1526 he became a Doctor of Divinity, a lecturer in his college, and examiner in the University. During his years at Cambridge, he diligently studied the Bible and the new doctrines emanating from the Reformation in Germany. A chance meeting with King Henry the Eighth at Waltham Abbey in 1529 led to Cranmer’s involvement in the “King’s affair” – the annulment of Henry’s marriage to Catherine of Aragon. Cranmer prepared the defense of the King’s cause and presented it to the universities in England and Germany, and to Rome. While in Germany, Cranmer became closely associated with the Lutheran reformers, especially with Osiander, whose daughter he married. When Archbishop Warham died in 1532, the King obtained a papal confirmation of Cranmer’s appointment to the See of Canterbury, and Cranmer was consecrated on March 30, 1533. Among his earliest acts was to declare the King’s marriage null and void. He then validated the King’s marriage to Anne Boleyn. Her child, the future Queen Elizabeth the First, was Cranmer’s godchild. Cranmer’s sincere belief in the king’s supremacy in all matters, civil and ecclesiastical, was the mainspring of his political actions. This explains in part his gradualism and his seeming compromises with the king in church reform; and it finally led to his undoing. The only public liturgical reforms of any consequence in Henry’s reign were the king’s order that an English Bible be placed in every church, and the publication in 1544 of the English Litany, drawn up by Cranmer at the king’s request during wartime. However, as is clear from recent scholarly research, Cranmer’s liturgical ideas were well-formed by the end of Henry’s reign, and he had already done much work in reforming the breviary and the mass. In the reign of King Edward the Sixth, Cranmer had a free hand in reforming the worship, doctrine, and practice of the Church, leading to the publication of the first two editions of the Book of Common Prayer, which would come to be the defining text of Anglicanism. At Edward’s death the archbishop unfortunately subscribed to the dying King’s will that the succession should go to Lady Jane Grey, the king’s Protestant cousin, rather than to Mary, his Catholic sister. For this, and for his reforming work, he was arrested, deprived of his archbishopric, and imprisoned on the orders of Queen Mary the First, daughter of Henry the Eighth by Catherine of Aragon, and a staunch Roman Catholic who aimed to restore the English Church to papal obedience and who blamed Cranmer personally for the annulment of her mother’s marriage to Henry. Cranmer was subjected to daily interrogations during his long confinement in the Tower. He wrote two recantations of his supposedly heretical doctrines during his imprisonment, but at the end, during a sermon given immediately prior to his execution, he recanted his recantations. He died heroically, saying, “forasmuch as my hand offended in writing contrary to my heart, therefore my hand shall first be punished; for if I may come to the fire, it shall first be burned.” This he did at Oxford on March 21, 1556. Father of all mercies, who through the work of your servant Thomas Cranmer renewed the worship of your Church and through his death revealed your strength in human weakness: by your grace strengthen us to worship you in spirit and in truth and so to come to the joys of your everlasting kingdom: through Jesus Christ our only Mediator and Advocate, who is alive and reigns with you, in the unity of the Holy Spirit, one God now and for ever. Amen. The Collect is adapted from the propers provided for the commemoration of Thomas Cranmer, Archbishop of Canterbury and Reformation Martyr, in the Church of England’s Common Worship.